Review: 2012-12-31, good first round and spectacular finish: Semmy Schilt vs Daniel Ghita 2 gets three stars. Semmy Schilt (42-6-1) entered as the No.3 heavyweight in the world while Daniel Ghita (47-7-0) entered as the No.5. In their first fight Schilt defeated Ghita by unanimous decision (September 26, 2009); this second fight is the final of 2012 Glory heavyweight tournament – GLORY 4 Tokyo. Watch the video! Review: 2012-12-31, nice one-shot knockout between Daniel Ghita and Jamal Ben Saddik: three stars. Daniel Ghita ranked as the No.5 heavyweight in the world, entered the fight with a record of 46-7-0 while Jamal Ben Saddik had a record of 24-1-0. Ghita defeated Mourad Bouzidi in the quarterfinals while Saddik won against Remy Bonjasky; Ghita vs Saddik is the semifinal of 2012 Glory heavyweight tournament – GLORY 4 Tokyo. Watch the video! Review: 2012-12-31, nice exchanges and high pace between Daniel Ghita and Jhonata Diniz: three stars. Daniel Ghita ranked as the No.5 heavyweight in the world, entered the fight with a record of 44-7-0 while Jhonata Diniz had a record of 7-2-0. 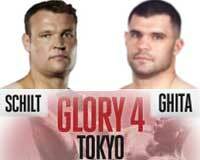 Ghita vs Diniz is the eighth-final of 2012 Glory heavyweight tournament – GLORY 4 Tokyo. Watch the video! Review: 2012-12-31, fight not very technical but exciting thanks to some heavy exchanges and three knockdowns: Errol Zimmerman vs Jamal Ben Saddik gets three stars. Errol Zimmerman ranked as the No.6 heavyweight in the world, entered the fight with a record of 76-16-1 while Jamal Ben Saddik had a record of 22-1-0. Zimmerman vs Saddik is the eighth-final of 2012 Glory heavyweight tournament – GLORY 4 Tokyo. Watch the video! Review: 2012-12-31, pretty good fight between Semmy Schilt and Brice Guidon: three stars. Semmy Schilt (39-6-1) entered as the No.3 heavyweight in the world while Brice Guidon (28-7-0) entered as the No.11. In their first fight Schilt defeated Guidon by unanimous decision (March 23, 2012); this second fight is the eighth-final of 2012 Glory heavyweight tournament – GLORY 4 Tokyo. Watch the video! Dream is alive and will be combined with the GLORY 4 Tokyo Heavyweight Grand Slam kickboxing show that had been scheduled in early December. The show’s name is: “DREAM 18 and GLORY 4 Tokyo – New Year’s Eve Special“. The fight card is expected soon.